The Housing Alliance Action Fund endorses candidates who support the movement for safe, healthy, affordable homes for everyone in Washington. Learn about our endorsed candidates here. 3. Participate in the Primary Election August 7, and the General Election November 6! It's important that you vote in your state and local races, and don't forget about ballot measures! 4. Take it to the next level! 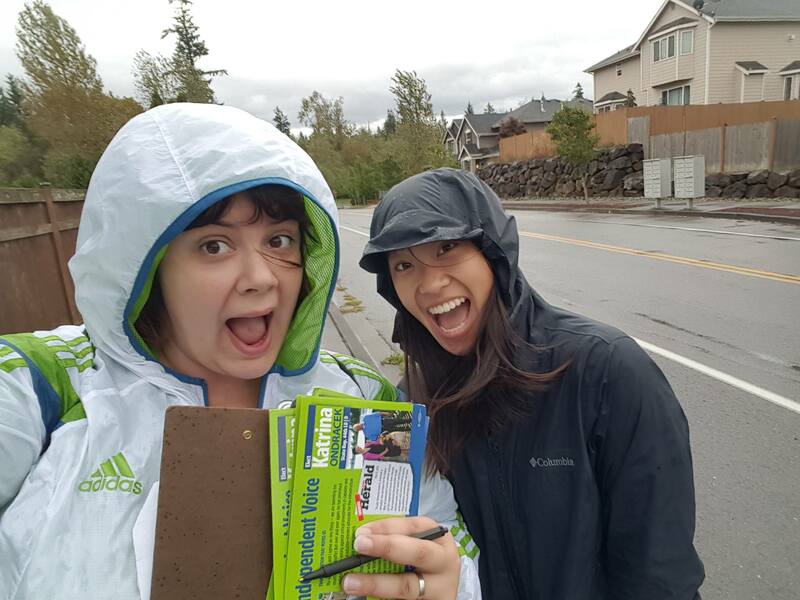 Be a volunteer: Help us phone bank or door-knock housing voters in support of specific candidates or measures, register voters, and encourage voter turnout. Sign up for upcoming volunteer shifts or contact teresac@housingactionfund.org. The Action Fund works to support organizations and partners to empower every eligible housing resident and community member experiencing homelessness or housing insecurity to register to vote and further engage in civic opportunities. Attend a candidates forum: Elevate affordable homes and an end to homelessness in this year's election. Put your questions to the candidates, find out more about how they plan to tackle these urgent issues, and be an informed voter. Secure pledge-to-vote cards from housing community members who are registered to vote to demonstrate to elected officials that these communities are engaged and care about the issues - particularly policy decisions impacting housing and homelessness. GOTV engages newly registered voters and lapsed voters to vote and mail in their ballots. Reminders: email, postcard, signage, etc. Events: ballot parties, phonebanks, community canvasses, etc. To create a Voter Engagement Plan for your organization, contact Teresa Clark at teresac@housingactionfund.org. Candidate and community forums are an easy way to shine a light on affordable housing and homelessness issues this election. Click here to find a candidate forum near you! Know of a forum we should add to our list? Email us!